Teyandei, in Nishi Azabu, is probably my favourite izakaya (a more casual dining establishment). Welcoming to couples (who can sit at the bar or share tables with others) and larger groups alike, the staff here are fun, energetic and loud. 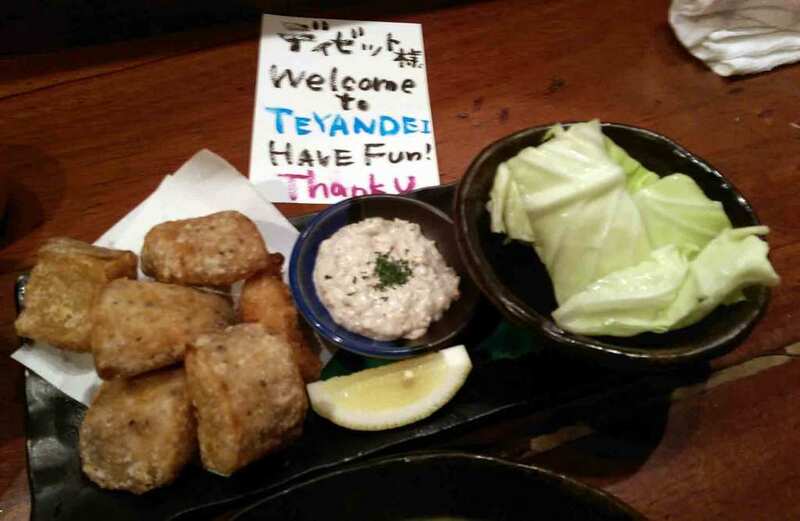 Teyandei is used to westerners so the level of English spoken is quite good, but luckily this doesn’t render Teyandei full of tourists – I would say that the crowd is largely Japanese and Teyandei retains its traditional izakaya-like atmosphere. 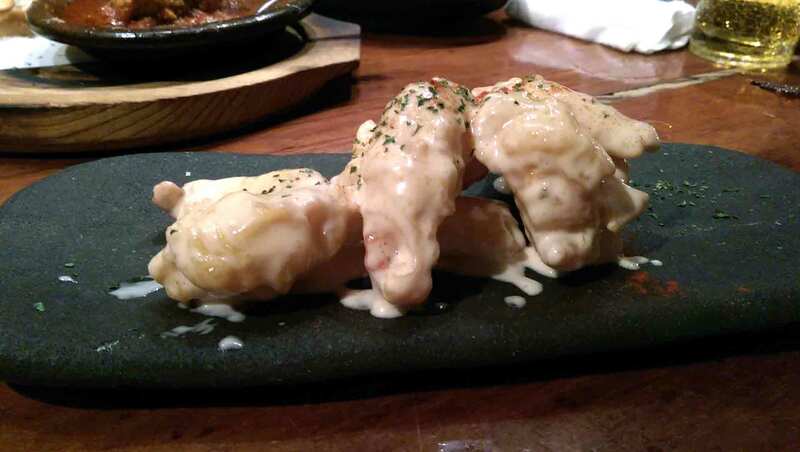 Although in izakaya’s the focus is generally just as much on the drinking as the eating, the food here definitely stands out. 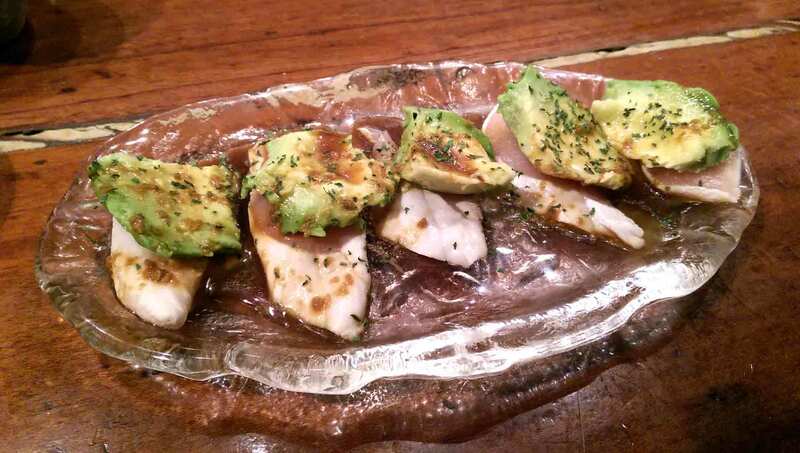 Coming a close second is the chicken sasami with avocado. Eating almost raw chicken does not come naturally to a Londoner (given the dangers of salmonella have been drummed into me from a very young age – apparently salmonella does not exist in Japan but don’t take my word for that!) The barely cooked chicken was so fresh that it almost melted in the mouth and the flavoursome avocado (lightly seasoned with soy) went really well with it. 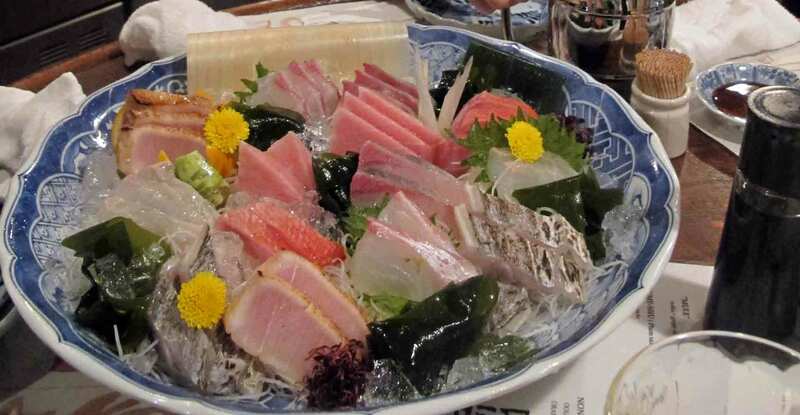 Teyandei can be found at Nishi-Azabu 2-20-1.
and Andy’s (at Japan, 〒100-0006 東京都千代田区 有楽町2丁目4-4) which is also famous for its seafood. Just off the main Roppongi drag is Frey’s famous pizzeria…don’t be fooled by its rough and ready appearance, Frey’s serves pizza to rival that I’ve had in Italy. Frey’s focuses on quality – it’s menu only has three different types of pizza + a daily special – and it shows. The Neopolitan style pizzas have crispy bases with great crusts (I always think a slightly doughy crust is key!) and are topped with sweet, fresh, flavoursome tomato puree and great quality toppings. If you’re missing western style food this is definitely the place to go. 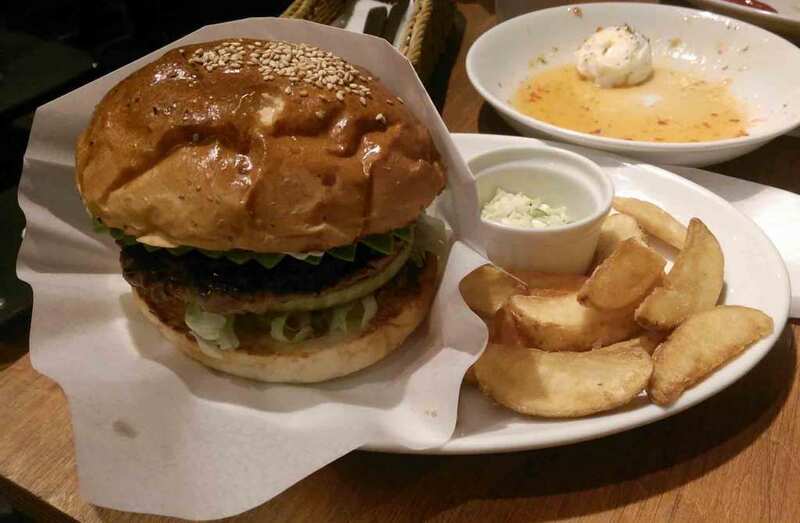 As you probably know from previous posts, before I moved to Tokyo I was not a fan of eating cow. And burgers, well in my mind they were chewy, flavour and nutrient-less processed beef that was definitely not worth space in my stomach. Fellows changed all that! I initially went along to accompany my friends but once their burgers arrived the smell was intoxicatingly good and I could see that the patties were made from pure, freshly ground, quality beef and were perfectly cooked (not chewy and not too bloody). So obviously I ended up ordering my own…. And it tasted as good as it smelled. I still don’t walk into a McDonalds and order a burger but I do try and always return to Fellows when I’m in Tokyo (especially when I know I have a heavy night ahead). Fellows can be found at 3-8-11 Kita-Aoyama, Minato-ku, Tokyo. 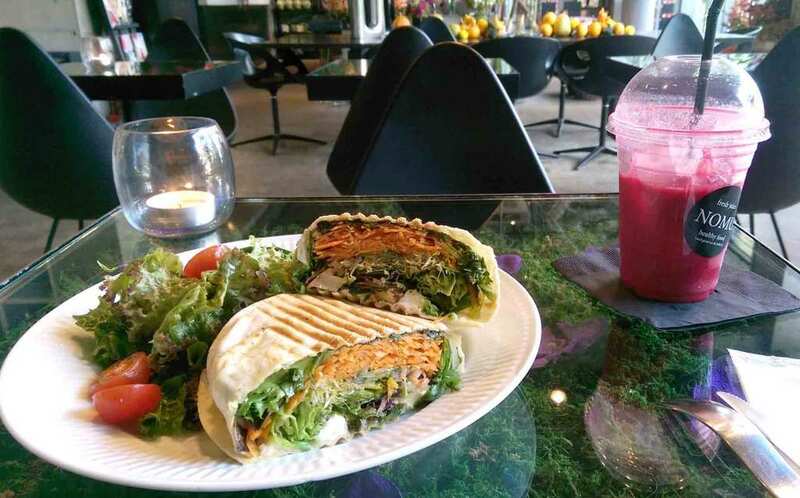 Owned by the same group as Teyandei, Joumon also has a relaxed, fun atmosphere and caters to a mixture of Westerners and locals (sit at the bar if you can so as to catch all the cooking action). Joumon focuses on yakitori (or various parts of the chicken on sticks). The simple food speaks for itself. Aside from chicken hearts, skin, breast, meatballs you can also get great side dishes (my favourite being what I can only describe as their version of a scotch egg – which is a huge (meatless) potato croquette with a runny egg inside and an amazing tartare like sauce) and various other meats or vegetables on sticks. Joumon can be found at 5-9-17 Roppongi | Fujimori Bldg. 1F, Minato 106-0032. 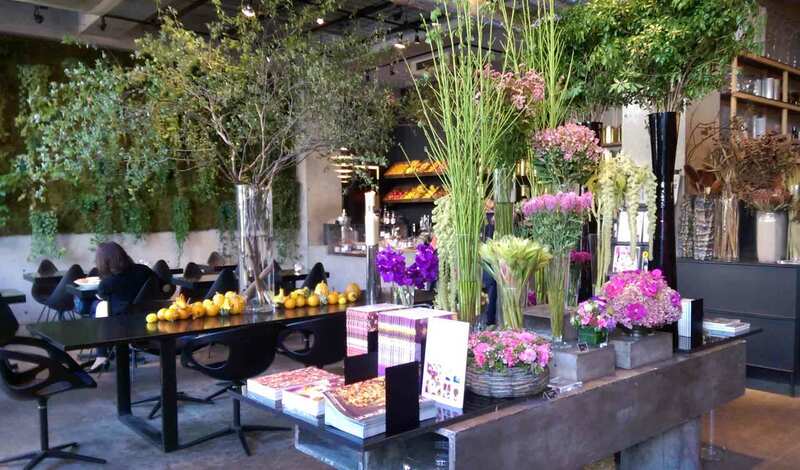 Set within the beautiful Nicolai Bergmann shop, Nomu cafe serves up delicious healthy fare with a Danish focus…As you sit among the amazing floral displays you can enjoy an array of sandwiches (including smorrebrod), colourful salads, freshly baked goods and delicious fresh juices. I always make time when I’m in Tokyo to stop in and stock up on my five a day in a way that feels almost luxurious. 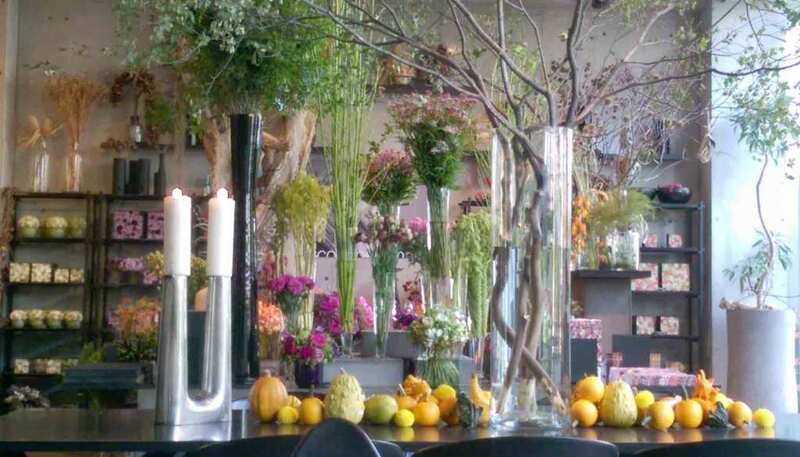 Nomu can be found at Minami-Aoyama 5-7-2. This entry was posted in eat and tagged food, Japan, Tokyo, Tokyo Tuesday, Tokyo Tuesdays. Bookmark the permalink.